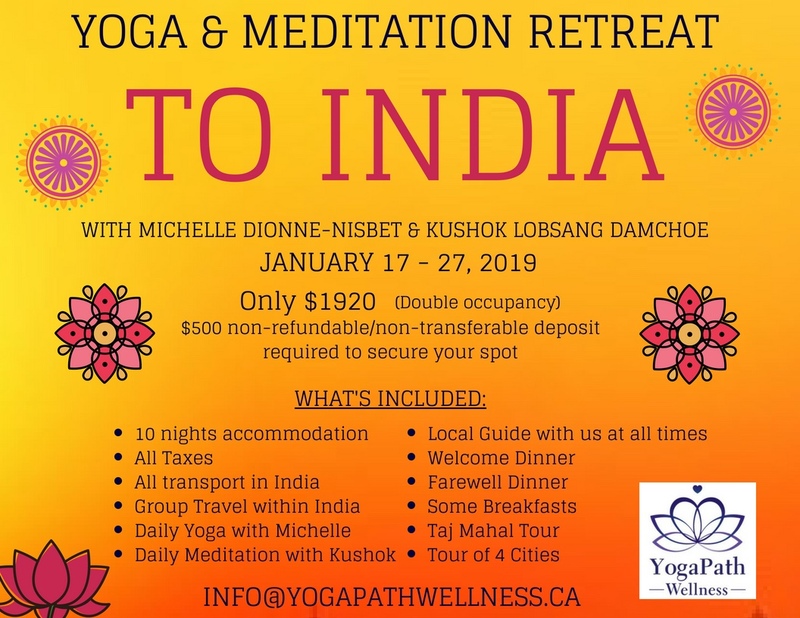 Join Michelle and Kushok for a trip of a lifetime! Find your own way to Delhi for January 17th, where the adventure begins!!! Here is where we will spend a few days to allow for the jet lag and culture shock to pass; and where the retreat officially starts with a group welcome dinner that evening. The next day in addition to the morning yoga and meditation practice, we will explore Delhi with our guide and see some of the neat places that make this city so beloved. On Sunday, January 20th, we will fly to Both Gaya. Kushok has a special connection to Both Gaya, as this is where the Buddha became enlightened under the Buddha Tree. Kushok will guide us through this amazing place on the 21st of January, after we enjoy our morning yoga and meditation practice. We will also have some time to explore on our own and/or shop. On Tuesday, January 22nd, we are going to take a bus to Varanasi, a very spiritual city on the banks of the Ganges river. Here we will enjoy 4 nights to allow for lots of time to tour temples, visit the ghats, experience some ceremonies and explore on our own to really get a feel of what this beautiful and spiritual city can offer. Yoga and meditation will be offered every morning. On Saturday, January 26th, we will fly back to Delhi, where we will enjoy our farewell dinner as we reminisce about this experience and share our thoughts on what we loved the most. This is also an opportunity to enjoy some free time in Delhi as we hope to get back early enough for you to do so. On Sunday, January 27th, Michelle and Kushok fly back to Canada. You are welcome to continue your journey in India or wherever your heart may take you or you can plan to fly back with us. We only have 10 spots available for this retreat as we both wanted a more intimate group and smaller groups can travel through India a bit easier. We are unable to hold spots, so please send your deposits in as soon as you know you can come. 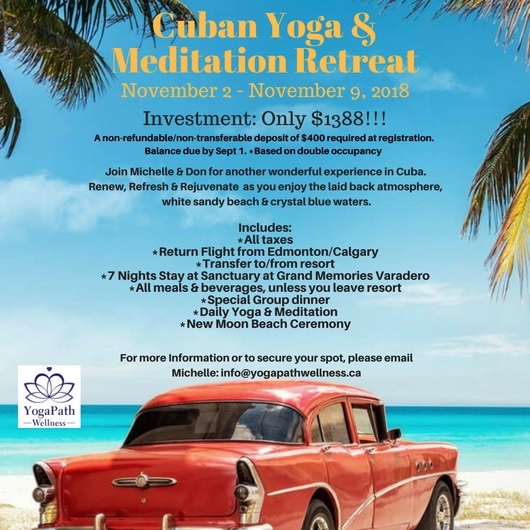 Cuba Yoga & Mindfulness Retreat November 2018! Join Michelle & Don for another week in paradise! We will fly into Varadero and get on a shuttle where we will be whisked away to the beautiful Sanctuary at Grand Memories Varadero resort which is perfectly placed on Cuba’s narrow Hicacos Peninsula. With 7 restaurants and pools, and a beautiful white sandy beach with crystal clear water, you will be well supported this week as you renew, rejuvenate and refresh. There is lots to see and do in Varadero, including a visit to Al Capone’s home, or perhaps pop in to Mi Casa Beatles, a favourite watering hole of the popular band; Maybe you would prefer to see the Saturno cave, a big opening in the ground (cenote) is filled with fresh crystal-clear water. You can swim or snorkel to see the beautiful stalactites and stalagmites formations, fish, and blind shrimps; Or perhaps a snorkel at Playa Coral, a large barrier reef with a variety of fish and corals. With so much to see and do, the hardest decision will be to decide on what! *All meals and beverages (breakfast, lunch, dinner, snacks, and beverages), unless you leave the resort. A $400 non-refundable/non-transferable deposit is required at time of registration by cash, check or email transfer. The balance of $988 is due by September 1st and can be paid with credit card. Join my husband and I in beautiful Jasper, AB as we lead a special retreat from Feb 23 – 25, 2018! The last 4 years, the retreat filled up very quickly, so don’t be disappointed and reserve your spot today! Relax, Renew and soak up the splendour of nature on this weekend yoga retreat. With the backdrop of picturesque Jasper, you will be invited to find your own inner practice through awareness of body, breath and mind. Taking time to both turn inwards for reflection and outwards for kinship, plan to travel down the path to wholeness together. My special guest, friend and mentor, Kushok Lobsang Damchoe, will be joining us again this year to share his vast knowledge of meditation as he guides us through our morning meditations and a Saturday workshop. Another special guest this year in my friend and painting instructor, Alan Pole, who will be guiding a mindful painting experience Saturday afternoon for those interested. Alan is a local Sherwood Park artist strongly influenced by the natural world. His work explores our relationship with nature and often depicts scenes of tranquility juxtaposed with nature’s raw power. As an instructor, Alan aims for his student’s self discovery through the exploration of art.